Did you get yourself a new iPod to store your favorite songs? Well, then you’re in luck! We’re going to be teaching you how to transfer music from iPod to iTunes, be it on a Mac or Windows PC, without too much effort on your end. Believe it or not, there are countless of ways of doing this. Although some are more troublesome than others, especially iTunes itself which poses limitations on the types of music that you can sync with your iTunes library! Fortunately, there are plenty of other iPod to iTunes data transfer programs that we can use. Stick around till the end and learn the other methods of transferring songs from your iPod to iTunes! For the most part, data transfer between iPod to iTunes is usually handled directly on iTunes itself. However, this is very limited. If you use iTunes, you won’t be able to properly transfer songs unless they were purchased from the Apple Music store. That is why we’d recommend checking out a third-party program instead — which we will introduce in just a bit. 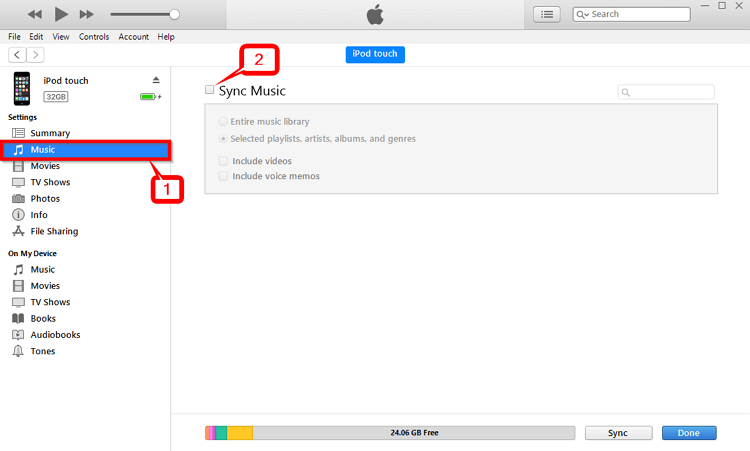 However, if you do still want to learn how to use iTunes to sync iPod to iTunes music, then keep reading! The first thing that you’re going to have to do is connect your iPod to your computer. If you have iTunes installed, then it should automatically launch the software for you once your device has been completely connected. 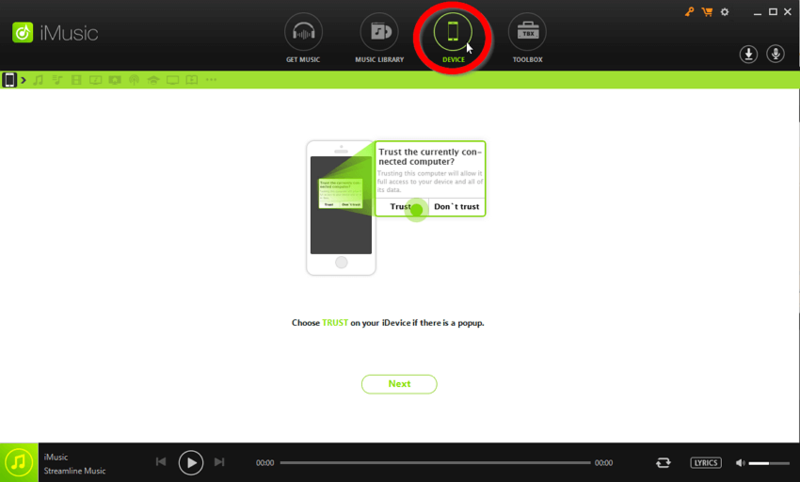 Select the ‘Device’ icon on the left corner of the screen (marked in the image below), in order to view your iPod settings. Select Sync in order to initiate the transfer, wait until the data sync is complete, and you’re done! The process of syncing data, as demonstrated above, is fairly straightforward. However, there are some issues that you might run into depending on the contents of your iPod device. It is Apple’s way of forcing its users to purchase songs directly from them only, which is really not all that realistic considering the numerous amounts of music resources these days. The most common issue is the “Remove and Sync” issue. This is a message that might pop-up after you toggle-on the ‘Sync Music’ option (as is demonstrated in Step 2 of our iPod to iTunes demonstration.) 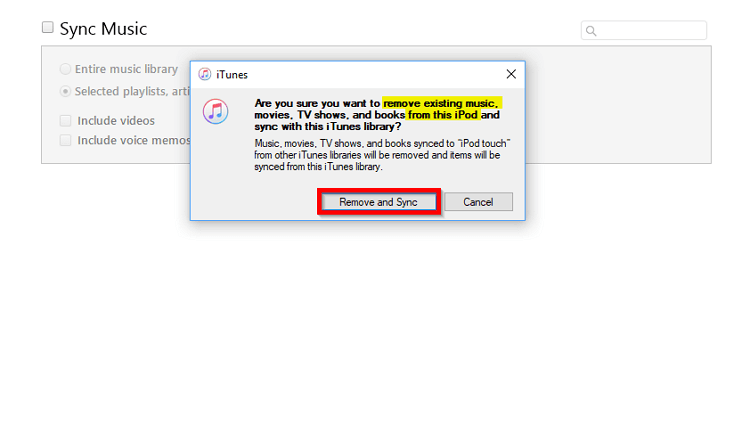 If you don’t particularly care about your music being deleted, then you can simply select the Remove and Sync option. However, just be aware that this will lead to the deletion of all non-Apple Music songs on your device. 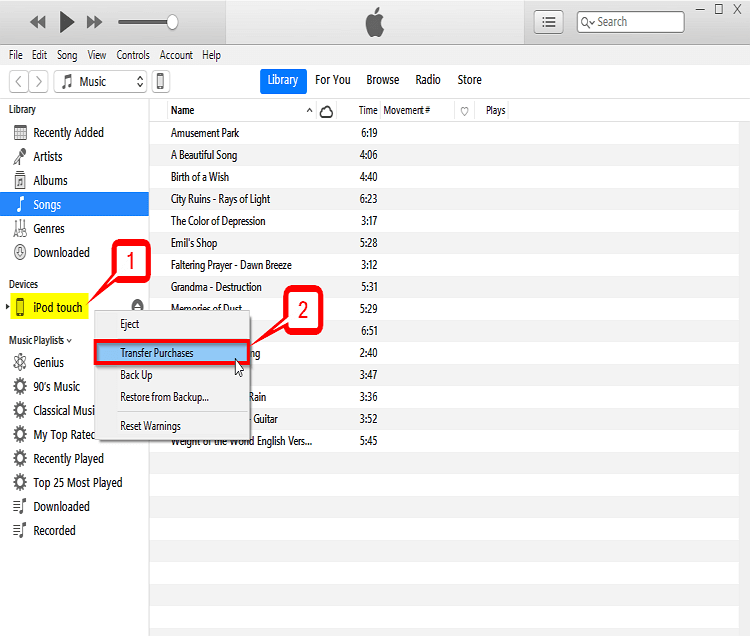 Another way of transferring the songs from your iPod onto your iTunes library is to use the “Transfer Purchases Issue.” This will move any non-duplicated song from your iPod music library and transfer it onto your iTunes library. It’s pretty helpful if you just want to do a quick transfer. However, the issue is that (once again) you won’t be able to transfer any song that was not directly purchased from the Apple Music store. Another common issue is if you happen to lose access to your account. You won’t be able to transfer iPod purchases unless you’re signed up on the same account that the music was purchased with. It’s an understandable limitation. However, that doesn’t change the fact that it can be frustrating to lose access to all your music just because of an accounting failure. In this case, there’s no real method of fixing it either. All you can do is repurchase each song separately. 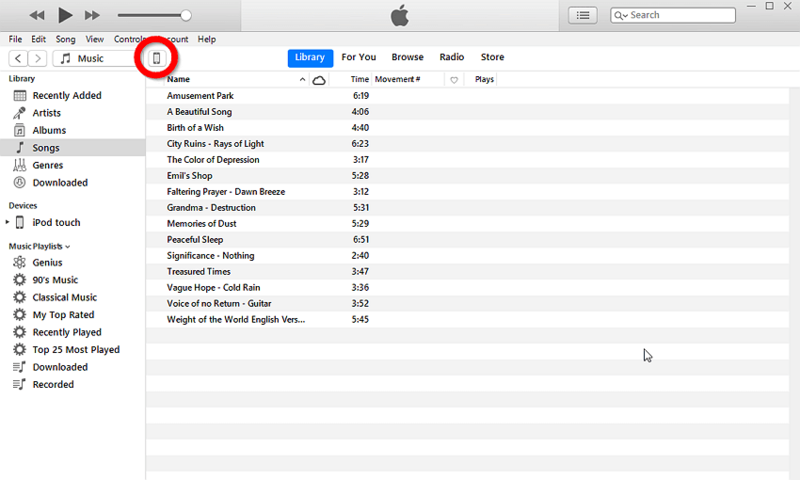 Now, as for our non-iTunes solution, we’re going to be using a third-party software called iMusic! 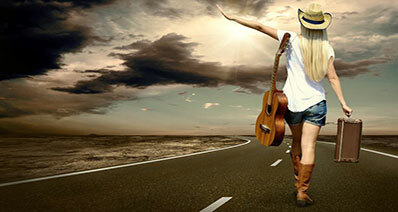 Which, unlike iTunes, will not limit the type of music that you transfer between your device and your PC library. 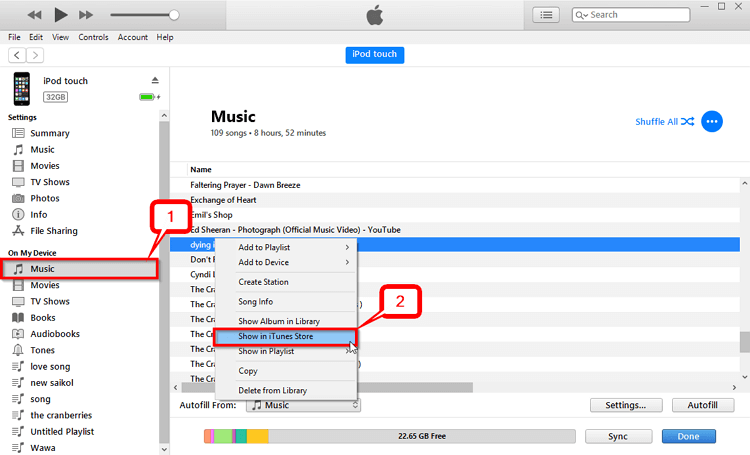 As we will demonstrate in the step-by-step breakdown, later on, iMusic will do most of the work for you! However, that doesn’t mean that you won’t be able to enjoy premium and advanced features that will allow you to micro-manage which songs/playlists get transferred to your PC! Transfer music from ipod to itunes without erasing existing data. 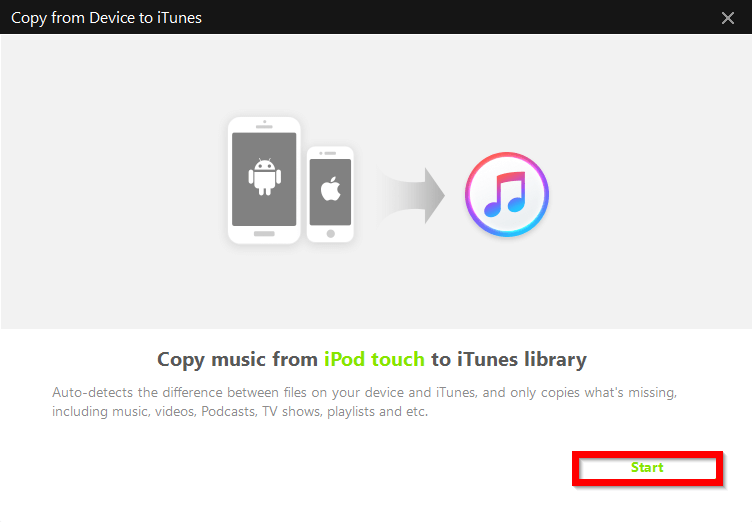 Automatic & Manual transfer of music from iPod to iTunes and vice versa. Full Back up and Easy Restoration features . Premium Toolbox for micro-managing data transfer. Convenient no-duplication system and tool for saving space. The first thing that you will have to do is connect your device and launch iMusic (which you can download on the iMusic official website.) Once your device is connected, select the Device icon on the top menu bar. The first time you connect your device to iMusic, you will have to allow its access. Don’t worry, it’s pretty easy! 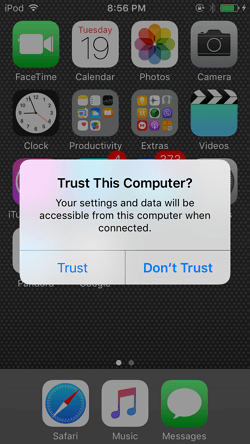 Just click the Trust this computer option that appears on your iPod screen. If you look back at iMusic now, you’ll notice that the screen has changed to display all the different options you have of transferring, backing up, and managing your device. 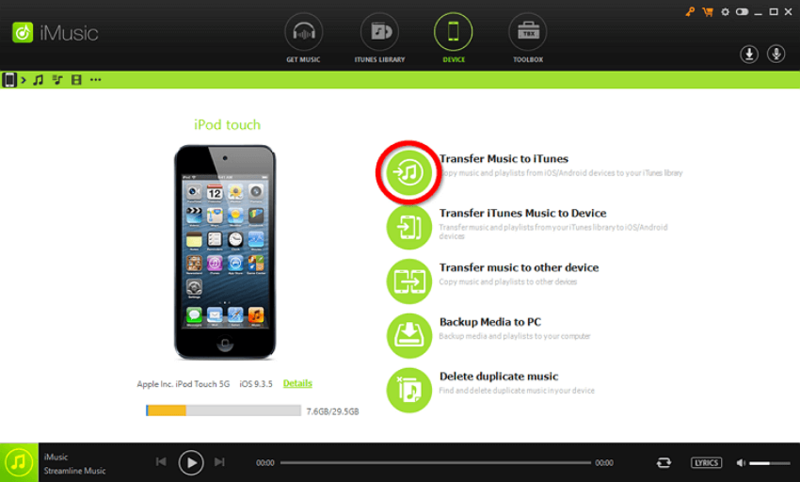 In order to transfer music from iPod to iTunes, select the “Transfer Music to iTunes” option. A secondary screen should have now popped up onto your screen (refer to the image below.) This is iMusic’s notice that it will scan your iPod and iTunes library to determine what files are available on either (to prevent duplication.) Initiate the scan by clicking the Start button. 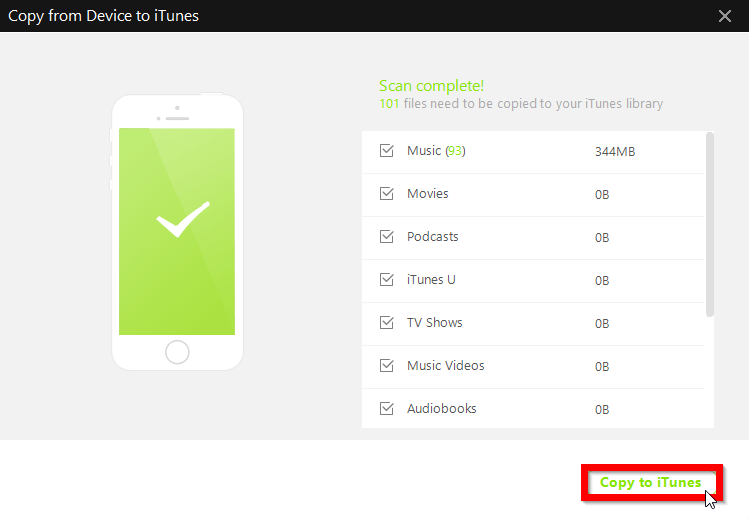 After the scan, you will be given the option to select which of the scanned (non-duplicated) items you want to transfer from your Device to your iTunes library. Once you’ve chosen which files to transfer, click “Copy to iTunes” in order to initiate the automatic transfer, and you’re done! Music transfer programs are really your best solution when it comes to transferring songs to your iTunes library, and fortunately — there are plenty of them around! Other than iMusic, you can also try out the following programs. Each of them will allow you to move your songs from your iPod to iTunes fairly easily. In fact, many of them work identically to iMusic which is more than what can be said about iTunes convoluted limitations. The first program on this list is Syncios. It’s one of the programs closest to iMusic when it comes to features and efficiency, and so it deserves its own spotlight. Syncios has been around for a while now, at least long enough for it to warrant several renewals — so make sure that you download the right version if you are going to use it! Part of the beauty of this program is its sleek design, after all. Although there is a reason to believe that the complex nature of it might prevent smooth sync procedure. Data transfer for iOS and Android Device. Full Data Recovery with backup and restoration tools. Premium toolkit for micro-managing manual transfers. A FREE trial is available, however certain features are limited. Cost of the full program is at $29.95 . The complexity of the design interface might result in confusion and bugs have been reported that prevent the smooth transfer of data. 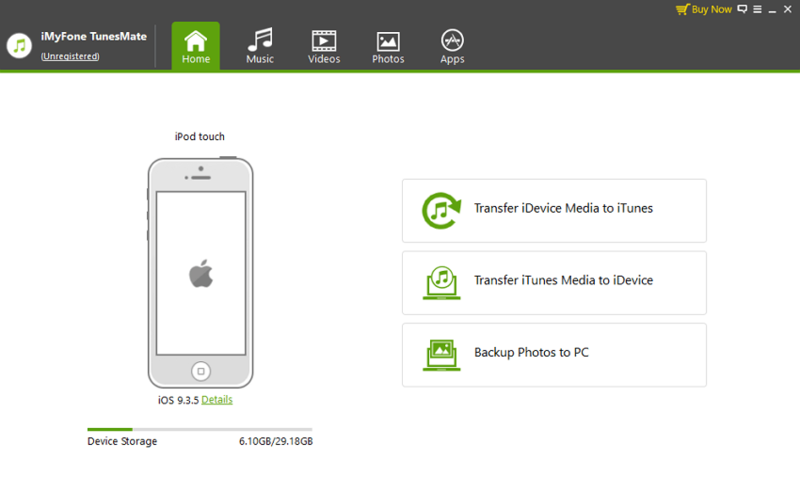 Media Transfer between iPod and iTunes. One-Click photo export feature for transferring photos from device to PC. Extra Toolkit for transfer management. FREE trial is limited . Both subscription cost and the cost of the full-license is rather expensive. Older and less sleek interface. iCareFone, and our number three — iMyFone are practically identical. There really isn’t much to differentiate between the two. Outside from the color of the design and the graphics. Features-wise, however, and that is the most important — they do the same thing. The only reason iMyFone is below iCarefone is because of its interface. Which you may or may not prefer to iCareFone. It’s really just a subjective kind of view. 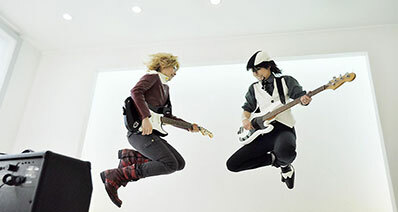 Music Transfer between iPod and iTunes. 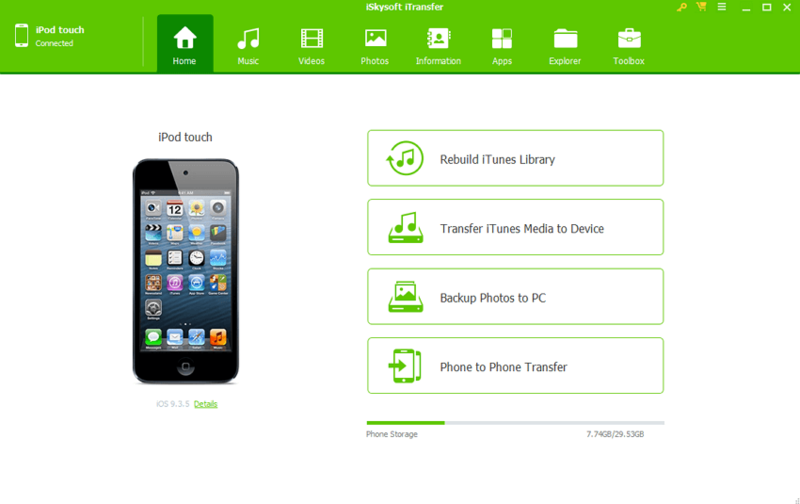 Data transfer (including videos, music, photos, apps, etc.) . Full back up and restoration available. Both the cost of the subscription and the full-license are expensive. The interface is very basic. It lacks some of the advanced features featured on other transfer programs. In all actuality, iSkysoft probably deserved a higher spot on our list. It was just a matter of cost that left it as our fourth choice. Of course, that doesn’t mean that it is a bad program. It’s actually one of the closest the other data transfer programs could get to iMusic (which is the one that we recommend the most.) 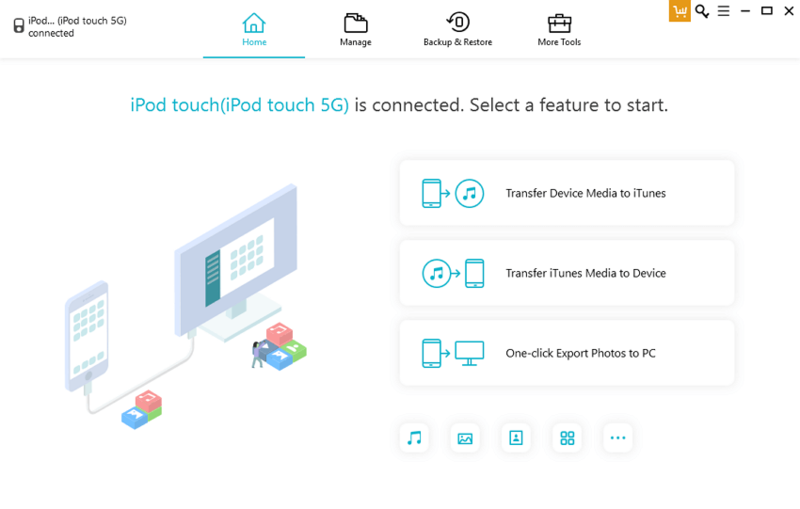 It offers the same advanced and premium features, but it also makes sure that it’s got the basics down to pat — allowing you to transfer data as quickly and as trouble-free as possible. Completely rebuild iTunes library based on your iPod library. Data transfer available for iTunes library to Device. Photo, video, apps, etc. data transfer option also available. Most expensive subscription-based software — 49.95 per year. Although similar to iMusic, the iTransfer is a lot older, and as such is lacking when it comes to certain upgrades . It’s video and music format support are also rather limited. Again, similar to iSkysoft, dr.fone could probably have earned a higher spot on this list. The only reason why it is so low was, again, the price. It’s a subscription-based program, and as such you’re expected to pay annually if you do decide to keep it. That isn’t necessarily a bad thing. However, if you want to use it for the long term, the cost of upkeeping might be a lot more than you’d want to spend for something you might use just every now and then. High-quality design with a very intuitive interface. Efficient device to iTunes transfer. Premium transfer tools for a variety of data options. FREE trial is available but highly limited. A subscription-based program that costs $39.95 per year. Because it offers so many features, it might get a bit confusing because there are so many tools that can be used. Conclusion: It can get pretty complicated to use iTunes to transfer music or data of any kind really. There are a lot of limitations posed in order to maintain the status quo of their services. Which isn’t really that bad of a thing. However, there’s no denying that life can be made 100% easier if you use a third-party program to do most of the work for you! For that, we recommend the iMusic software. Check it out for yourself and see just easy it is to use!